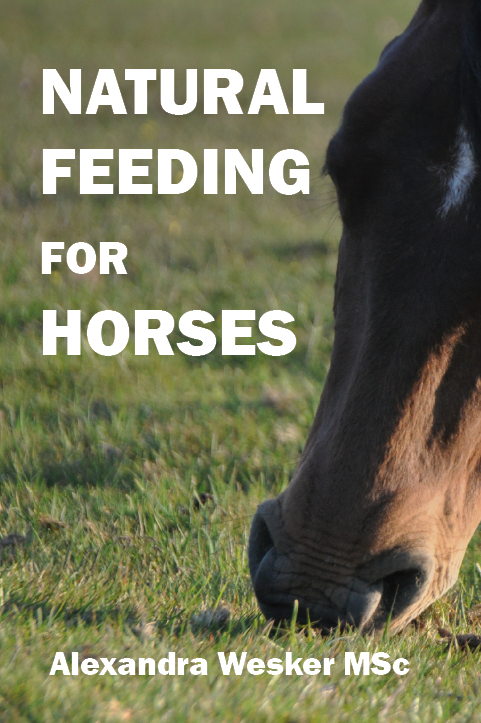 Learn how to feed your horse the natural way! Natural Feeding For Horses is now available on Amazon! Feed your horse the healthy way! As the first book of its kind, Natural Feeding for Horses introduces a step-by-step feeding system based on how horses live in nature. Also included are example diet calculations which give an insight into how a Natural Feeding diet should be constructed. The book is written by independent horse nutritionist Alexandra Wesker, MSc RNutr MRSB RSciTech. About the concept and how it works. psychological reasons: the way the brain works. In this chapter you learn about the different ways in which roughage can be preserved: as pasture, hay, haylage/silage and straw. This chapter also discusses common grasses and legumes and their characteristics. Chapter IV: Factors affecting the nutritional requirements of your horse. This chapter gives you an understanding of factors that affect nutritional requirements. These include body weight, exercise, breeding and other factors such as growth, temperament, breed and age. This chapter helps you to take a major step in feeding more naturally: how you can make sure your horse has feed continuously available! The second major step in creating a more natural diet: making the diet more uniform, taking a big step towards a healthy gut. An introduction into what Natural Feeding levels are and why they are so useful. In this chapter you estimate the Natural Feeding level that is right for your horse. You can feed your horse healthily and specific to their needs! In this chapter you find diet suggestions for your horse, based on the Natural Feeding level you have previously determined. If you need to make changes to the diet to optimise it to you horse's individual requirements, then here is how you do it. Monitoring your horse's body condition is the prime way to knowing whether your horse is fed at a Natural Feeding level that is right for him/her. Is your horse gaining or losing weight? Here is what to do. Dietary requirements change if you increase training or go on a holiday. This chapter tells you how to adapt your horse's diet to these changes. If you breed with your horse, or if your horse is growing or getting older, then this affects his/her dietary requirements. This chapter tells you what your horse needs in his/her diet. Whether you can decide on the grass species on the pasture or whether you cannot change you horse's diet at all, here you will find further tips to make you feeding practice more natural. This chapter discusses a variety of example horses, each in their own situation, and how their diet can be made to be more natural.